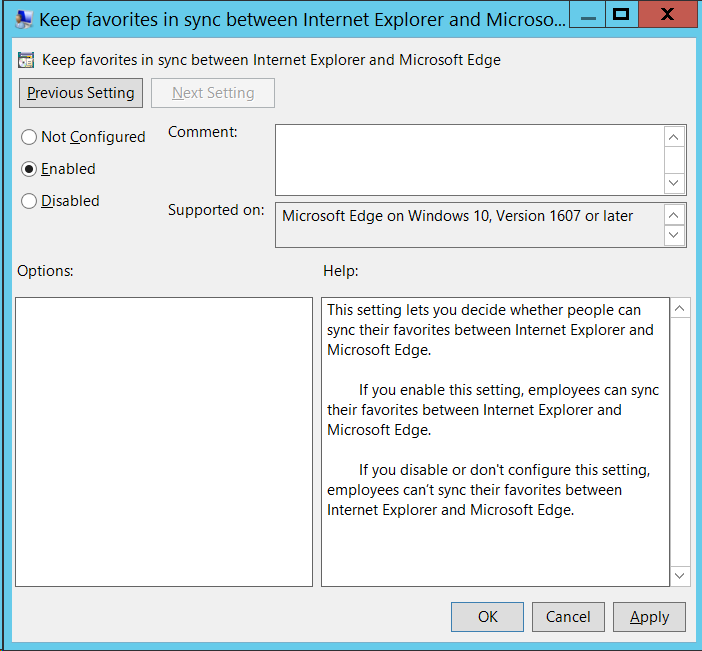 In the latest release of Windows 10 insider preview (Build 15002) there is a new policy setting added that allows you to sync the IE Favourites with Edge. This policy setting allow you as an IT administrator to not have to setup the browser favourites in multiple locations thus reducing duplication of effort. 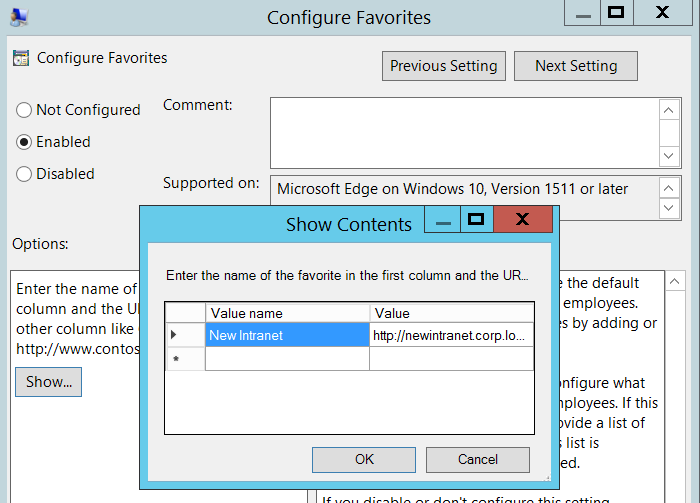 Previously you may have had Group Policy Preferences Shortcuts configured to manage the IE Favourites (see below). However, this only configured the Favourites in IE and not Edge. 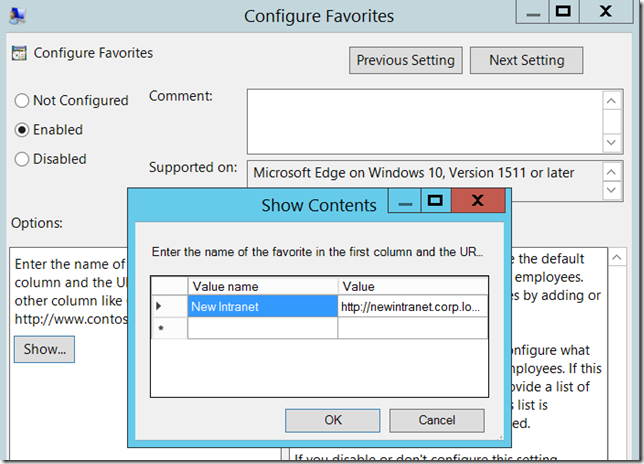 It was possible to configured Edge Favourites however this was a separate policy setting called “Configure Favourites”. However this still meant that you needed to maintain a separate Favourites List for each browser which normally meant a double of up settings changes when ever they needed to be updated. And once enabled you now have all the IE Favourites appear in the Edge browser in almost real time during the next Group Policy updated. Tip: As of this build it appear that this policy does preserve the current Edge configured Favourites, but if you deleted these they do not come back. Do we need new ADMX Templates for the Domain ? 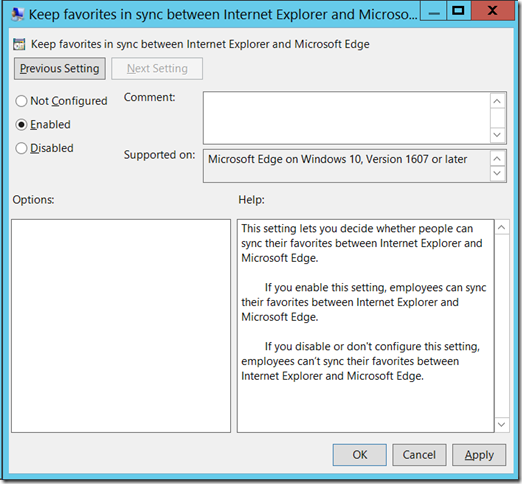 For all intents and purposes, is this basically making it where both Edge and IE read from C:\Users\\Favorites?